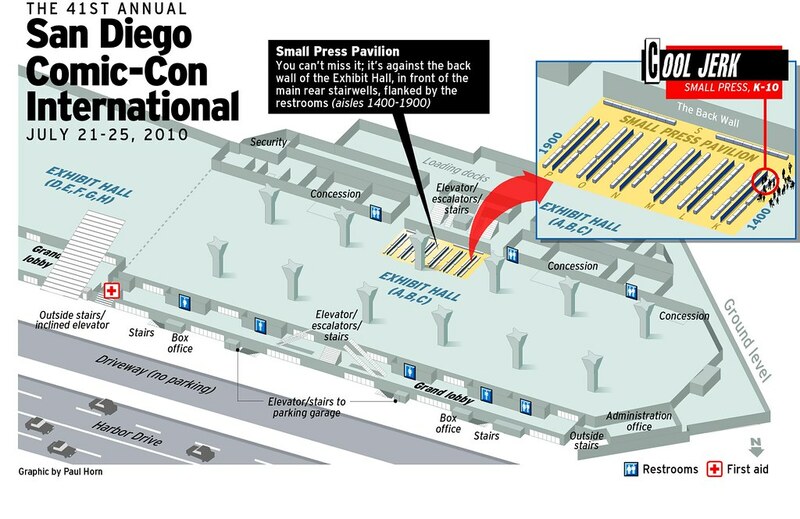 Cool Jerk » Archive » Get Bimboozled at Comic-Con 2010! Get Bimboozled at Comic-Con 2010! What the heck?!? Keep reading! • Debuting at SDCCI: my FOURTH comics collection, Cool Jerk Vol. 3: Bimboozled! Unlike other trilogies (“The Matrix,” “Star Wars,” “Smokey and the Bandit”) these books keep getting better and better! Like Hodabeast and Chickadoowa that precede it, Bimboozled is loaded with more than 200 strips, and nearly 15% of them are Bimboozled-exclusive (i.e. they appear ONLY in the book, and haven’t/will never be online)! Sketches, Director’s Commentary, Outtakes, the insane-o Index… all there! Foreword by CHEW creator John Layman! $12. • Of course I’ll have plenty of copies of Hodabeast (Cool Jerk Vol. 1), Chickadoowa (Cool Jerk Vol. 2) and Doc Splatter Ominous Omnibus to help fatten up your library! The Cool Jerk volumes run $12 a pop, and Doc Splatter is $8. • Didn’t get a Cool Jerk T-shirt last year? They were pretty popular so I did a reorder. It’s probably my favorite design so far (it was Darlene’s idea). It comes in a myriad of sizes, in both crew neck (M/F) and ladies’ tanktops. $15. Now this THIS I’m really excited about. I’m debuting Cool Jerk Panel Canvases at Comic-Con! What you’re looking at in the photo above is an assortment of small, gessoed canvases stretched onto a wood frames. 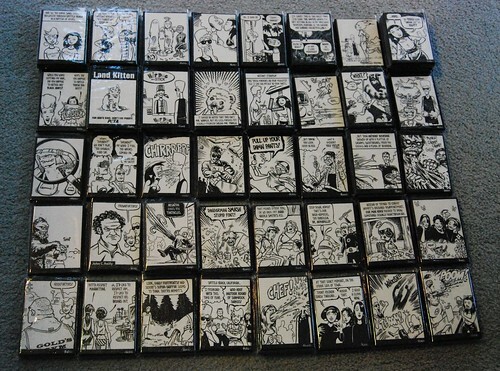 Darlene and I pored over hundreds and HUNDREDS of my comics, and chose 40 panels that either consistently made us laugh and/or would be a sure-fire crowd pleaser. Supply is VERY LIMITED — we hand-manufactured only about 60 of these bad boys; for most of the panels, there was only one copy made. First-come, first-served! You have to see ‘em to believe ‘em. Perfect for your desk, wall or gallery! IT’S A POCKET MASTERPIECE! $25. • ALSO debuting at Comic-Con this year, Cool Jerk original art! Yes, you read that right. You’ve seen ‘em in Chickadoowa and Bimboozled. I’m selling the Sharpie roughs I use to create Cool Jerk (click here for more on that), and each sheet usually has two strips roughed out on it. Ready for the price of these one-of-a-kind keepsakes? READY?!? $5. That’s right. A five-spot. A fin. A Folding Lincoln. THAT’S CRAZY CHEAP! • How about my 24-Hour Comic starring Doc Splatter? I’ll have a few of those, plus stickers, NEW glow-in-the-dark buttons, window decals and other Cool Jerk shwag you can’t possibly live without! • If you’ve been to my table before, good news! Team Cool Jerk is in the exact same spot we’ve been at since 2003! Here’s a map I whipped up as a refresher! Click it to Comic-Con-Size it! Lots of good stuff here, folks! If it weren’t for you, I wouldn’t be doing this — I really appreciate your support, enthusiasm and friendship. I thought you were also going to be selling kisses but hugs were free? @Darlene: That’s what Cool Jerk subscribers are going to get with their annual SDCCI coupon! Wow, the tee is a must-have! And someday, if possible, I may need to pay you a bunch of dollars for a custom CJ canvas featuring my favorite panel…you know the one! More JERKEA shirts please. And can I put in a request for a canvas panel?? Can’t wait til the follow up book!